To celebrate the 3rd anniversary of Pokemon Center Online, The Pokemon Company is kicking off the final My151 Big Thank You Campaign in Japan. 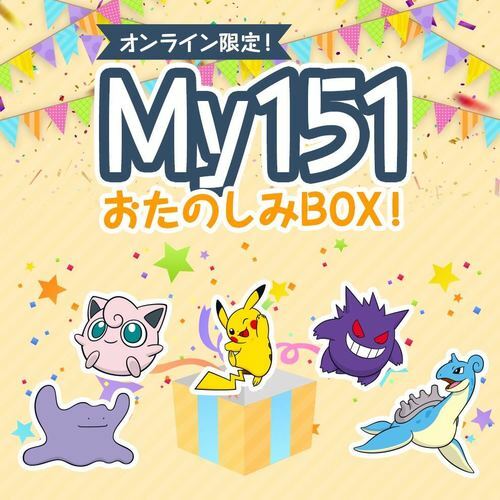 As part of the campaign, The Pokemon Company has announced Pokemon Center My151 Lucky Box. For a small price, you will find a random assortment of Pokemon Center merchandise such as plushies, stationary, clothes, and more inside a large box that measures 46cm×38cm×36cm. The Lucky Boxes come in special random designs so you never know what you’re going to get. The Pokemon Center My151 Lucky Box is similar to the PikaPika Lucky Bag that ran out in hours earlier this year, so you can check out the contents of the various PikaPika Lucky Bag to have a rough idea of the amount of items inside (keep in mind products are entirely random, and the PikaPika Lucky Bag and giant Pokemon Fit plushies are not included). International pre-orders have started at NintendoSoup Store on February 16, 2019 for USD79.99.